Well it’s here. 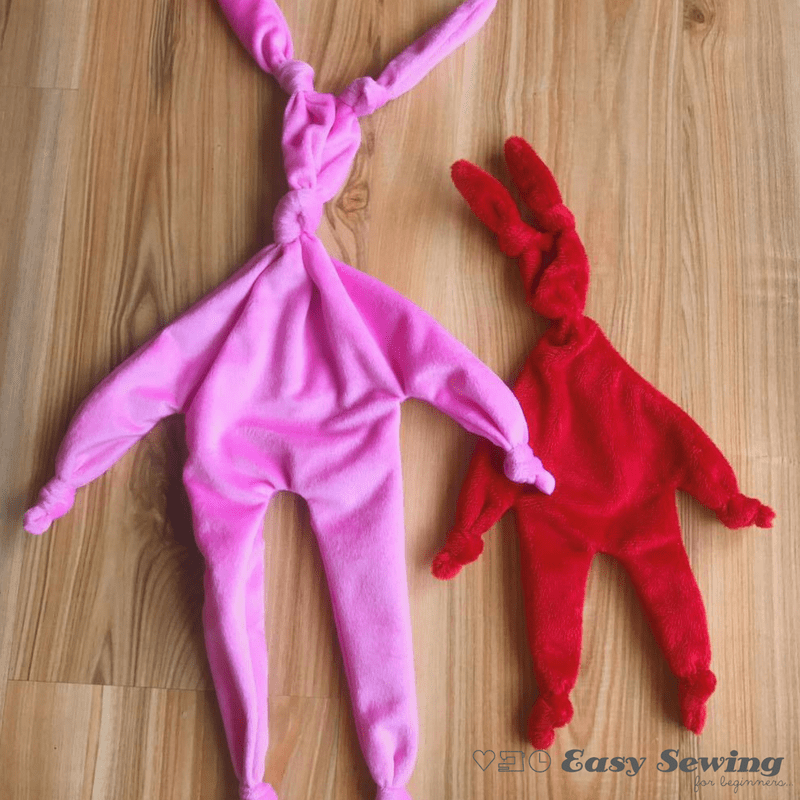 I’ve been making these knot bunny lovey comforters for nearly every friend who has had a baby over the last year or so and it was about time I finished writing and filming the tutorial for how to make them. They’re very quick and easy to make and I designed the pattern to be very forgiving for beginning sewers. I hope everyone loves them as much as I do ? 23″/60 cm of Fabric for the Mini Knot Bunny (minky or cuddle fleece fabric would be the cuddliest!) I’m using minky. It’s my favourite fabric! Knot Bunny Template Get the FREE mini knot bunny template here or purchase the pattern PDF for the large knot bunny template. You can also Purchase the paid pattern from my Craftsy or Etsy stores, if you prefer. 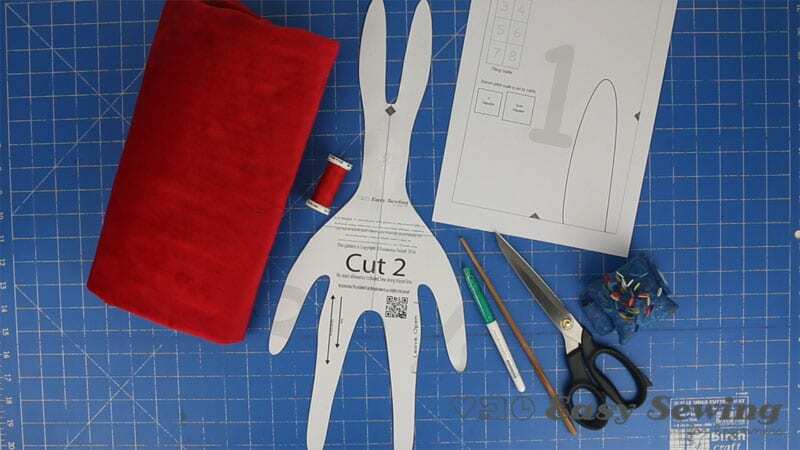 Print out the first page of the pattern pages. Grab the FREE template here or Purchase the full PDF pattern for the large knot bunny template. 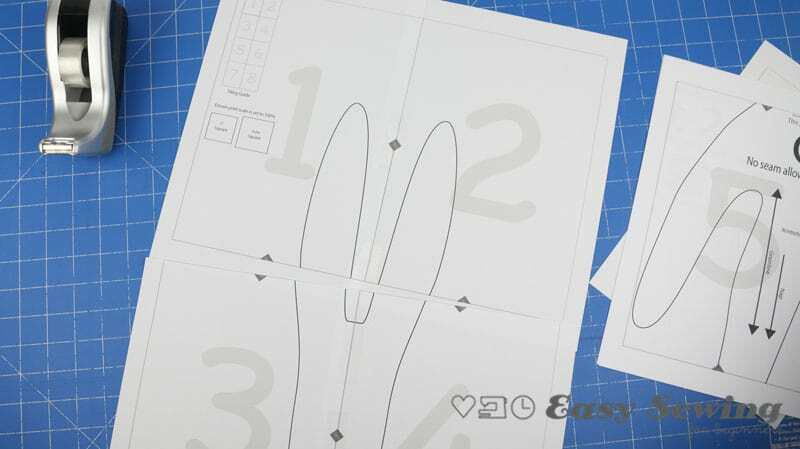 Cut out the paper template of the knot bunny. 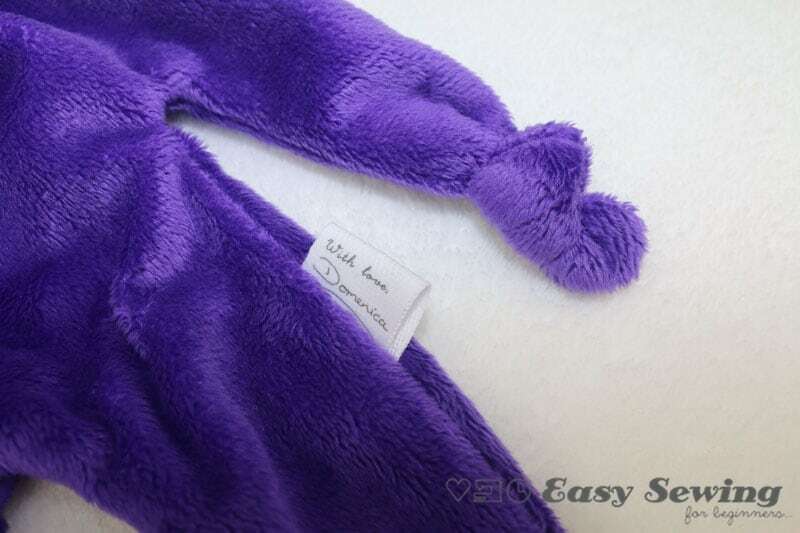 Tip: If you are using minky or cuddle fleece fabric, ensure the nap (like cat’s fur) is running downwards. If unsure, pat the fabric and see which direction feels the softest and lies the flattest! Pin the paper pattern in place on the two layers of fabric. Trace around the paper pattern. 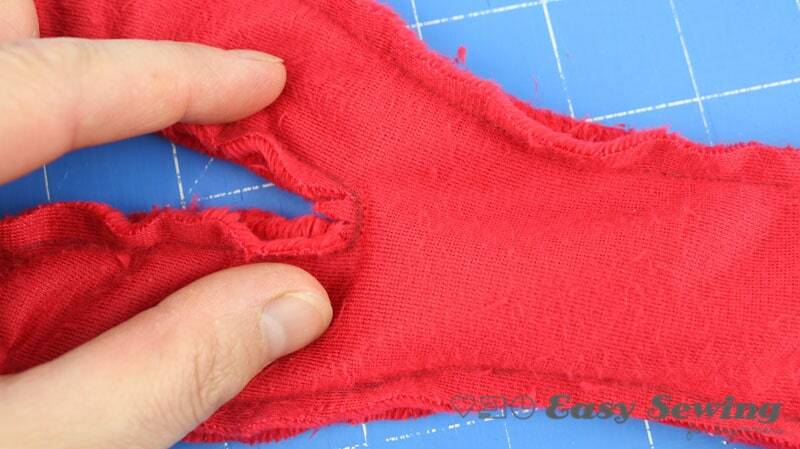 Remove the paper template and replace the pins back in to hold the layers of fabric together. 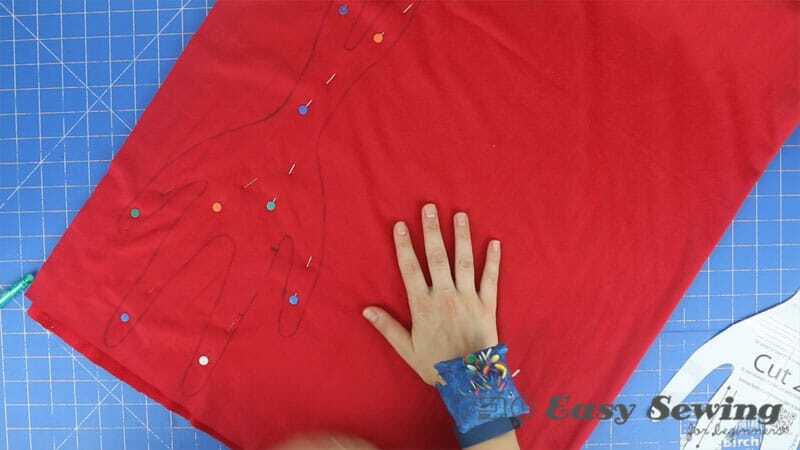 The fabric may shift a bit so the more pins you use the better. Tip: Now would be a great time to put in your own personalized label just like in the photo below. You can see how I make them in this step by step tutorial for how to make your own labels! 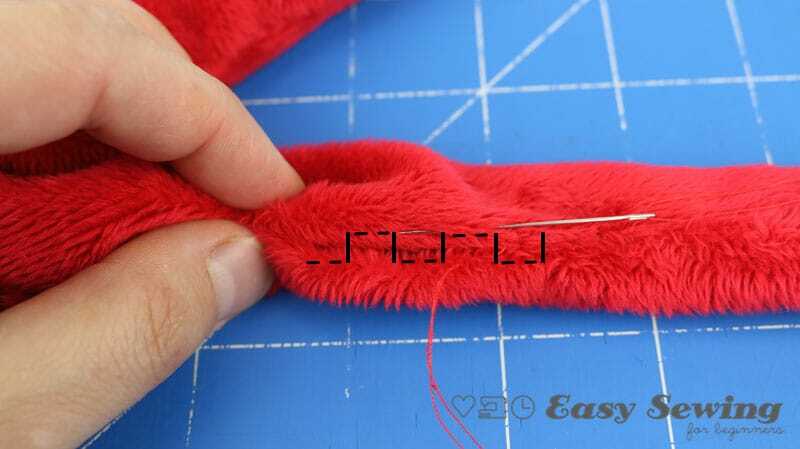 Starting from the bottom ‘leave open’ marking and sew along the line all the way around the bunny until you reach the next ‘leave open’ marking. Use a matching thread colour for best results. you should now have a 4”/10cm unsewn opening. Cut out the knot bunny approximately 3/4” / 1cm from the sewn line. 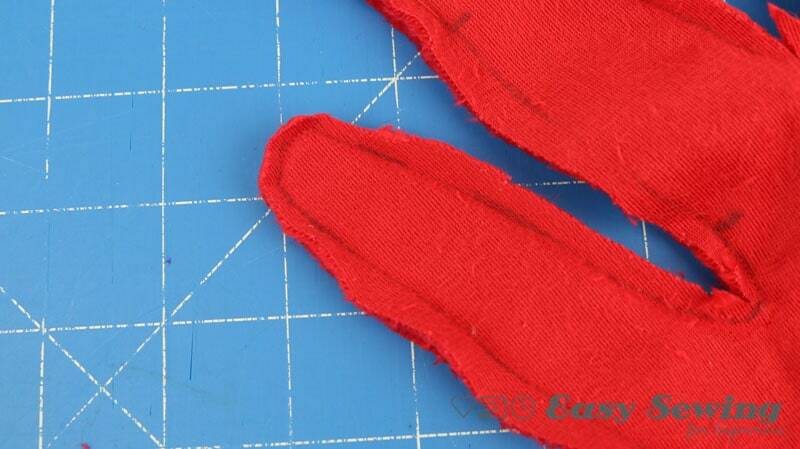 You may want to trim a bit closer to the sewn line to reduce the bulk around the outward curves on the tips of the ears, arms and legs. Snip the seams along the outward curves. 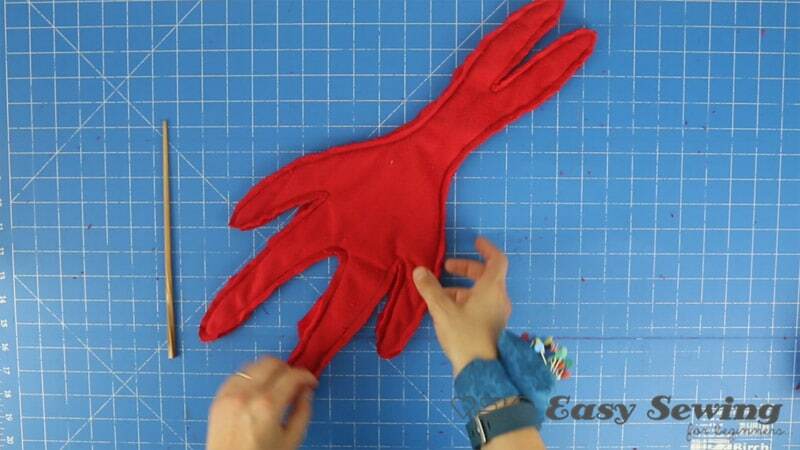 This will help when you turn the knot bunny right side out! Turn the knot bunny right side out. Use a chopstick or another blunt ended object to push out the ends of the ears, arms and legs. 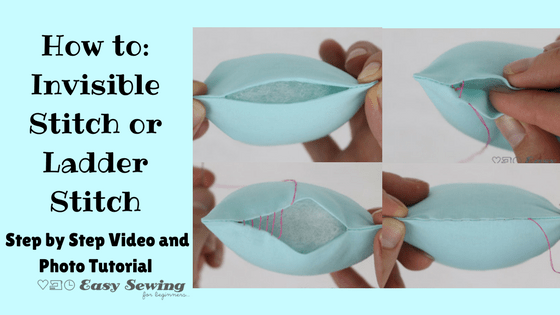 Check out my favourite tool for turning and stuffing softies. Be sure to secure the thread at both ends. Tie a knot at the bottom of each of the ears. Tie a knot at the end of the arms and legs. Tie a big knot in the middle of the neck section on the large knot bunny. 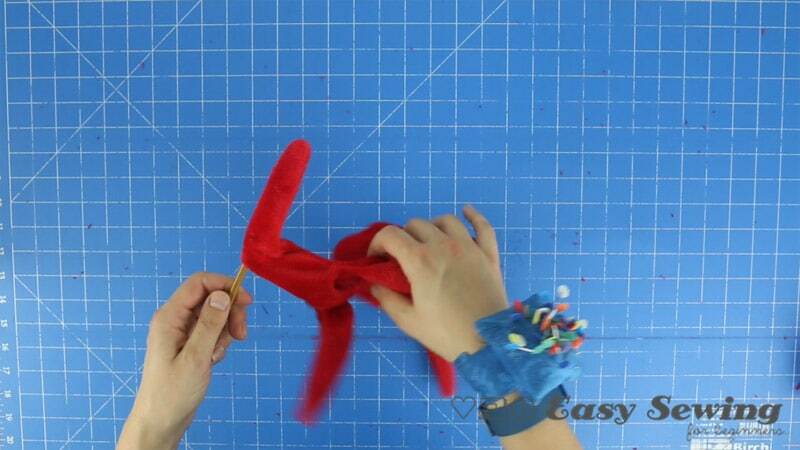 For the mini knot bunny, gather at the neck and hand stitch back and forth to hold together. Secure the stitches well. You have now completed sewing a knot bunny lovey comforter. Congratulations! It is now ready to be cuddled ? 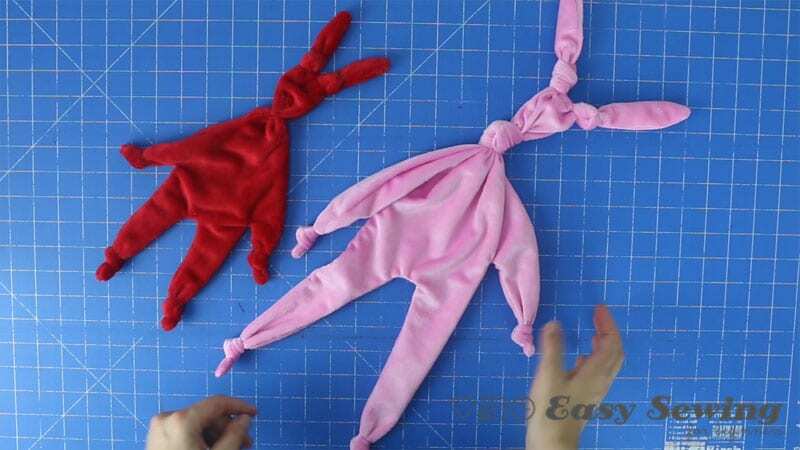 I hope you love making these knot bunny lovey comforters for all the babies in your life! Lovely simple idea for gifts. Thank you Cheryl. Thank you! These do make great gifts ? 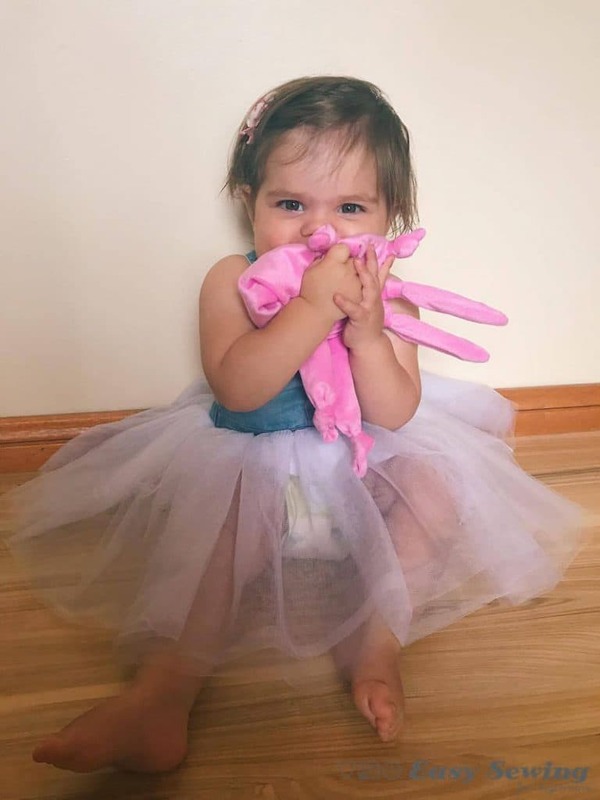 A great present for friends with babies, Domenica. I have two new granddaughters that NEED these!! Oh great. thank you very much ? 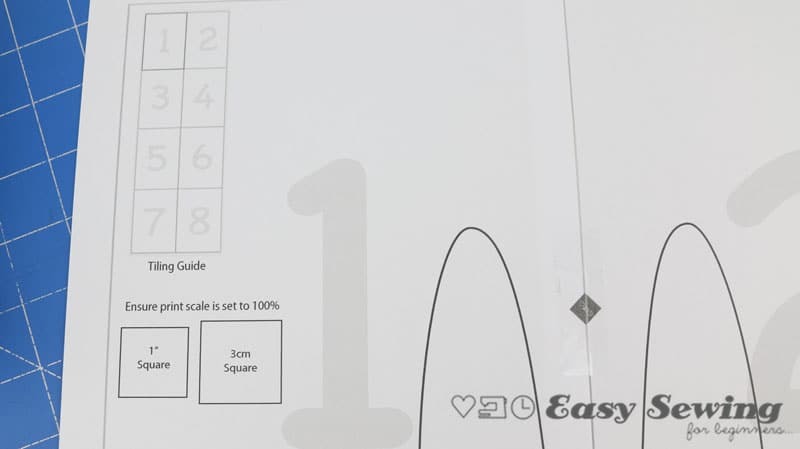 How so you check to see if you are printing the right size? I have never done this before, therefore, I am a little lost. Will appreciate any help I can get. Both of the templates are included in the full PDF purchase, so if that’s the one you have then choose only the pages for the required template when you are in your printer settings just before you hit ‘print’. I hope that helps. I may have not understood the question. These are adorable! What are the approximate finished sizes of the bunnies? Great project! I made the mini’s for the little ones who can’t do chocolate for Easter. Thanks for sharing! Thank you for the darling little project. 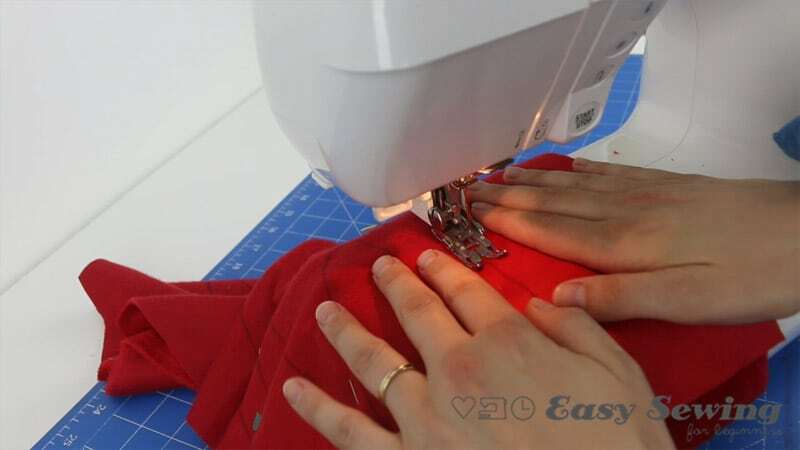 It is a great learning tool (sewing, pinning, cutting etc.) plus a sweet gift!